This article is aimed at those who fancy a go at spreadbetting, but haven?t a clue what to do. The hope is that by the end you?ll know enough to get started with a tiny bit of confidence. It goes on a bit, but compare it to books on the subject and you?ll realise it?s admirably brief. Trading requires deep pockets, right? I?m pretty sure that out of the 20 odd thousand T2W members not every one of them has £500,000 – £1,000,000 to invest ? in fact I?d take a long right now on the probability that thousands and thousands would consider £1000 quite a big lump to invest, especially as so many of us are struggling to learn how to survive, let alone win. compound interest and time will make you rich, regardless of where you start. If you are pants at it (trans: not overly effective) then you will achieve the reverse – a dwindling money supply (save the last 50p or so for a Mars bar, you?ll need the energy for running from the spouse). What can you do with £500 – £1000 then? Well, trading shares the traditional way is right out – a long trade on £1000 of shares means all your money is invested in one trade ? that?s very risky indeed. After paying the broker to buy the shares, plus the spread (more on that soon) plus a tax called stamp duty in the UK, it all combines to ensure that even after risking everything on one throw of the die* you?ve as much chance of coming out ahead over anything less than a glacial period as I have of becoming Pope. daytrading type, you could run a number of trades per day at £1 per point. As an example I?ll choose five stocks from yesterday (20 January) selected solely on the basis of their margin requirements and imagining we had mastered trading to a perfect level. You could, for example, have traded General Motors, Biogen, Home Depot, Qualcom and Intuit. If, through amazing prescience, we had shorted at the highs and longed at the lows ? Home Depot we profited by £74, £55 on GM, BIIB (Biogen) we made £297, INTU we went long and made £155, QCOM we made £110. Okay, my cheapo calculator says that with this perfect timing and £1000 in my SB account I could have made 69% profit in a single day. £1000 may not seem that much to start with, but let me tell you, at 69% a day I could make a hamster a billionaire inside a year. Unfortunately, though, even Luke Skywalker with the force would be unable to achieve this level of trading mastery and while spreadbetting may make it easier to make a few trades on a limited budget, it does not, of course, make trading itself any easier. I?m not going to attempt a comprehensive coverage of spreadbetting here but I am planning to highlight a few things that will speed you along the path from ?rabbit in headlights? to ?frightened but having a clue? – after that it?s up to you to decide where to go next ? this is for raw beginners. Okay, first off ? what is a spreadbet? Simplified the spreadbetting company is a bookmaker, they list things you can spreadbet, like shares, indices, commodities, forex and so on, some offer bets on sports, mortgage rates, all sorts. I?m going to stick to shares mainly, the mechanics of trading financial items like shares, commodities (all that ?buy sugar, sell lean hogs? stuff) and indices (buying/selling bets on the Dow, FTSE and so on) work pretty much the same. Sports etc won?t be wildly different, but I don?t touch them. Before you open a cash account, you can trade with pretend money (paper trading) with most of them, so you can practise long before you risk real money. Accounts can be funded online with your switch or credit card, and it all goes through fairly quickly and smoothly these days. A number of companies are mentioned in countless threads and there are also reviews in the T2W reviews section ? go read some. I?m going to use things I see/do in my Capital Spreads account as being ?typical? spreadbet company stuff, different companies will vary in how things are done, what is available, etc ? but in the main they?re all going to have more similarities than differences. So, you enter your username, tap in your clever password (pa44w0rd ? cue furious logging in to change passwords all over the planet) and you see a list of popular bets on offer, plus a bunch of tabs offering you the option to look at different lists. This is the sort of thing you?ll see once past the login ? 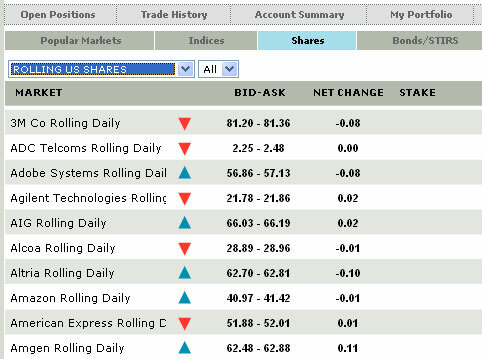 these screenshots were taken after the US markets closed on Friday 21 Jan 2005, by the way. This is just a mix of bits and pieces, but we can use this to see what info is available to us ? obviously the column reading ?closed? isn?t much use right now, but let?s check the rest out. Whichever spreadbet company you go with the info here will be somewhere around the screens your own spreadbet company presents ? you?ll soon become familiar with other screens. Okay, tabs at the top, left to right. Open positions lets you see all current bets, you can see what you have in play, and there are simple icons to click on to call up a dealing window to close each one. To open a bet you also just click on an icon, a small popup appears to tell you the current prices on offer, and there are ?buy? and ?sell? buttons on it, also (of course) a button to quit without trading because you went off the idea. Buttons/icons are there to call up charts, info on the share, transfer to portfolio etc (not shown, as markets are shut, are buttons to initiate your bets). Why is there more than one price on offer? Yes, there is a price for buying, and one for selling ? they are different, look at the DAX Rolling Daily above (never mind what it IS, just look at the price…). 4193-4196 is the quote, if you want to buy this bet, ie you are betting that the DAX will go up, then you buy at 4196. If you think it will fall you short it (sell) at 4193. If you are watching the Dax on a live feed like esignal or ADVFN then it might be showing 4194.5…. if you are long it has to go up 1.5 points before you break even at 4196, a short trade will break even after it has fallen 1.5 points to 4193. That?s the basic idea ? the company quotes one price to buyers, a different price to sellers, and the few pennies in the middle is where they make their money day in, day out, taking a few coppers off every trade (that, and people like me losing, of course). This is a single dropdown, listing the share collections we can look at to find items to trade. We?ll see shortly what ?rolling? and ?Quarterly? means…. you see that Capital Spreads will let you trade UK, US, European, German (DAX) and French (CAC40) shares. Okay, let?s concentrate on stocks ? each spreadbet company will be different, but generally speaking you?ll find lots to trade, each company deciding what to offer bets on. You DO therefore need to keep an eye on things, a share that gaps down $2 will cost you £200, and stop losses only work if the price passes through them, not past them. Some spreadbet companies offer guaranteed stops ? ie you?re out at the chosen price, gap or not. These tend to cost more in the form of a bigger gap between the price you enter at and the price you break even at ? all spreadbets, on entry, will be at least a pound or two in loss because you?ll be ?the spread? adrift at entry, the trick is to get to break even and into profit as soon as possible! The spread varies, depending on what you trade, but it?ll generally amount to a small bit more than the bid-ask spread you see in your real-time datafeed…. it?s shown on the screen, and continually updated when markets are open, so just make a point to check it before trading…. there?s no point trading a share that is rangebound in a 10c wide range if the spread is 15c! Why are some prices different for different months? We haven?t finished with price yet ? check this screen out…. What gives? Well, first off as the market is closed the spreads tend to go a bit odd, the bid and ask (ie the sell and buy prices) get a lot further apart ? when the markets are open these spreads are much tighter, but they still show what I want to get across ? the prices differ for different bets on the same share (or index, commodity, etc). The ?June? price is where you are betting that the price will go outside the quoted spread in your favour before the June bet ?times out?… it?s a bet on the future value of the share, and bets are made based on them closing on a specific date in March, June, September, and December each year. Consequently Capital Spreads are offering bets on the ?next two quarters?, so in March the March future bet will stop trading and anyone still holding a bet at that time will either have it closed out and the profit/loss then showing will be applied, or it can be ?rolled over? (I?ll explain that in a moment). ?Some people have contracted to deliver some shares in American express on a specific date in March (or June, etc) to some other people. The first group think that they know what those shares will be worth then better than the second lot, and vice versa.? It?s not really complicated (ho ho), but it is outside the scope of this little piece, so feel free to read up on futures…. just think of it as ?what the share is expected to be worth? and it?s chart for American Express. It also explains why the March price and the June price are different to each other ? different delivery date, different period to calculate interest over… different futures price. The daily rolling price is, by contrast, a delight ? it will match what you see on your real-time screen, give or take the few cents/pennies the spreadbet company are skimming off each trade. Consequently when you look at the daily rolling price and compare it to the live price for the share, hey presto, it matches. Now I for one find this easier to handle ? the spreadbet quote moves (a trifle sluggishly at times perhaps) as I see the price on my real-time charts move, and what I see on the chart is pretty well the same as on my spreadbet positions list – the difference is the bit they skim off, a cent or two mostly, and I know where the price needs to be on the real-time chart for it to equal breakeven on my account. What was that ?rolling? bit, and what is ?rolling over?? Suppose you were long on American Express at 52.01, you entered during the ?doldrum? period (from 11.15/11.30 to about 2pm EST… call it 4.15 ? 7.15pm UK winter time). The chart is stubborn, it refuses to move as the close approaches and you are positive it?s going to climb…. you could close the bet and enter a new one tomorrow, this will cost you a few pounds all told, or you can ?roll it over? ? a small fee (rolling over a daily bet on a $25 share came to about 20p yesterday when I did it) will ensure the bet stays open and resumes tomorrow. Now personally, at the moment, I don?t want to do that ? I was trying to close the bet I mentioned and due to a minor hitch the market closed seconds before I got to the icon to do it. I don?t like it, because overnight gaps are fairly common, and whilst a gap up of $1 would be a nice £100 bonus at £1 a point I don?t want to pay £100 per dollar moved if the gap is in the other direction! However, it is possible to do it, if you want to. IMR means the ?initial margin requirement?, and basically it tells you how many pounds must be free for trading for every point bet on each share, index etc. On Capital Spreads AXP (I got fed up typing American Express, that?s the ticker for it), has an IMR of 250. That means you must have £250 in the pot, free ? ie not already allocated to a trade ? for every £1 you want to bet on AXP. So you bet long on AXP for £1 a point, you need £250 in your account. If your losses get big enough to exceed what you have then you will be given a short period to put extra money into your account. After that 2 minutes is over (okay, maybe a bit longer ? I?m just trying to stress that they aren?t going to wait very long at all before you?ve had your chance) they?ll close open positions until you are in the black, or they?re all shut and you still owe money. Now if you have only got a few hundred quid, and are limited to a minimum of £1/point, then seeing Google with an IMR of 500 is going to tell you something ? you can?t afford to trade Google. You look at your account balance, and however many pounds are in it is the total IMR you can afford to bet ? so if you have £500 in the pot and trade Disney (IMR=130) and General Motors (IMR 200) that?s 330 gone, you can?t trade anything with an IMR above 170 without closing one of the open pair because the IMR will add up to more ?points? than you have got pounds to cover. Simple. What I find useful ? okay, I am currently trading small amounts in the daily US shares, I have copied many of the ?daily US rolling? shares to my portfolio, and I have the same shares set up in esignal for charting. I?ve typed the same list into Excel and it lists the IMR and the sector the share is in as well as other things such as volatility. Right at the very bottom are shares I don?t touch ? ADCT (ADC Telco) has an IMR of only 10… the share price is tiny, $2.30 or so, and a huge bar is about 3c in size… the spread is very small, but still huge as a fraction of the moves you can trade. There is a trade off – low IMR can be considered low risk from some viewpoints, with smaller price moves generally. Some $20 shares bounce around far more than some $50 ones, but overall the low IMR shares are less inclined to give a heart attack. The downside is that the swings can be so small that you are not really likely to gain a great amount from the winners, and there?s little point trading small positions where wins are minimal but spreads produce a steady drain. You need to find a price area you are happy and over time you will probably find you like certain shares and trade them much more often than others. It is also useful to know the share?s volatility ? you can get a range of data to describe this, volatility figures for different periods, ATR (Average True Range) and so on, but you can?t be sure which is best until you decide how you?ll trade. Somebody looking to trade over an extended period might find something like the 20 day volatility useful, but an intraday trader looking to move in and out of short period swings might find it more useful to find a tool capable of reporting the range or average of price swings the share experiences, or simply to eyeball a chart to visually assess that sort of detail. If you use Capital Spreads, and for all I know others do this as well, then your trade may have an automatic stop placed under it when you select a long (ie buy) bet – or above it if shorting. On Capital Spreads this is called a Computer Generated Stop Loss (CGSL) and they?ve got a formula that calculates an automatic stop at around 80% of the entry, which is nice I suppose, but personally my first action after entering a trade tends to be to move the stop much closer to the price ? it?s just a matter on Capital Spreads of opening the ?Order Book? tab, clicking the ?amend? button alongside the stop I want to change, and tapping a new price in. Why? If the chart goes the wrong way I want out, I got it wrong ? even so a rapid move can catch you out – so having the stop $2 away isn?t much use! What?s it like then? Here?s an example ? I decide that National Semiconductor (NSM) looks like it?s going to go up, it?s one of the tickers listed in ?my portfolio? which is the tab I have selected most of the time. 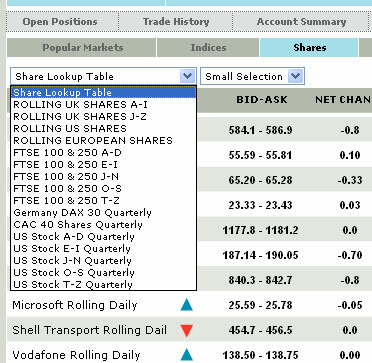 On the line alongside each share name in the portfolio (or share listing screens) there?s a button labelled ?trade? next to a small blank box. I click on the box so that I can type my stake into it, and as I?m small fry I type ?1? in to inform them that I want to place a £1 per point bet (ie I win or lose £1 for every cent NSM moves). I click the ?trade? button and a small popup appears that tells me the current prices on offer for NSM, one for shorting the price, one for going long on it ? I click the ?buy? button if I think the price will rise, and the ?sell? button if I want to bet on it falling (these boxes and buttons aren?t shown when the markets are closed, so they?re not showing in my screenshots). The important bit here is that the company don?t know which I want to do until I have seen their prices – they can?t wait to see that I?m going long and then raise the price a bit, which is one thing that might worry beginners unaware of how this works. I now have an open position as soon as the trade goes through, which is usually a few seconds after I hit the buttons. I can go to my ?trade history? tab and see this new trade listed there, I can look at my ?open positions? and it?s there. At the bottom of the screen my current account balance is shown, and for each trade I have active my open positions screen continually updates to show me which are winning/losing, and by how much, what the current prices for it are, what I paid for them, and so forth, so I?m never unaware of how much I have at stake, how much I am in profit or losing. If you?re one of the talented and lucky few who excel at spreadbetting you may eventually need to consider other means of trading the markets, such as direct access. No matter what the spreadbet companies say I?m sure they?re not really as pleased as they make out if a customer takes 10 grand a week off them, and you?ll be looking to save the extra cost over and above the spread visible in the market anyhow. It?s risky ? you are betting purely on the price move, so if NSM is $25.00 and it goes up to $25.10 at £1 a point, you stand to make £10 profit (ignoring the spread, which will probably mean you made more like £5) and you would have had to have £50 in your account to cover the margin requirement (IMR). Now, to make £10 on NSM through traditional share dealing would require almost $19.00 profit and you?d have had to buy 190 shares at $25 each, which is $4750, or around £2500. That?s leverage, using a small amount of money to get the effect of a much bigger amount. The downside to this is that you are effectively multiplying the price moves ? if you have a £500 account then proceed to pick a few bad shares that go down instead of up (shorts, obviously, would be the opposite) it doesn?t take long to have a bunch of trades that lose $5 between them – or £500 as far as your account goes! You have got to keep your eye on your trades, have effective stops in place to preserve your capital when you aren?t watching the price, and you must realise all the time that this leverage means you can go rich or broke much faster than you would trading the actual shares. If you think Amazon is going up, you bet long or a share trader would buy long ? next day it has dropped $1, the share trader grunts, that?s a 2.5% loss just about… the share isn?t a basket case but it?s going the wrong way. The spread betting customer with a £500 pot has lost £100, the account is down 20% in one go ? they don?t grunt so much as make a thudding sound. I have, occasionally, had the PC play silly B’s while I have bets in play, and recovered it all quickly enough not to worry ? but commonsense dictates that you keep a note of your account details and the spreadbet company?s phone number to hand. You really don’t want to be poised to exit a position, have the PC go down, and be unable to contact the spreadbet company to exit. Prices on the more volatile stocks can move quickly, and at even £1 a point a 10 minute loss of contact could be expensive. This is another reason why you should change the computer generated stop to a more sensible, closer position as soon as a bet is underway ? bad enough to find you can?t exit via PC and phone the day the local telephone exchange is hit by a meteorite, never mind having it happen when your stop is so far from the share entry that it represents a 50% loss! Some spreadbet types keep a mobile phone handy as a third backup system. There?s no limit, really, to how secure you might choose to make this. Finally ? the PC itself must be secure. You should have an antivirus program running, with virus definitions bang up to date, and the program set to update itself automatically. You should have it set to scan all incoming and outgoing mail, and not only schedule a regular scan of the whole PC but actually let it do it regularly ? scheduling it, getting annoyed when it starts, and hitting the ?stop scan? button doesn?t count! My favourite is Norton Antivirus, but there are a good few out there – just pick a good one. You should have a firewall program running ? I use Zone Alarm Pro, which costs about $30, there is a free version ?Zone Alarm Plus? that is almost as good and will keep you safe. this will help ensure that nobody manages to stick a small program on your PC to report interesting things like your username/password back to head office. The three items above will go a long way towards keeping you safe, and just about invisible to hackers. You cannot afford to have your PC crash due to a virus, you cannot afford to lose your passwords to a spyware program, and you certainly don’t want anyone spotting your PC on the internet and hacking into it while you are online. These programs should be on everyone?s PC if they go online anyway, and all together they?ll cost about £30. decide what to trade -commodities, shares, etc. decide the type of trader you are ? impatient types might look at intraday swings, those with excess patience might look for long term trends. stick all the instruments you intend to pick the trades from into your spreadbet portfolio. consider doing what I do ? 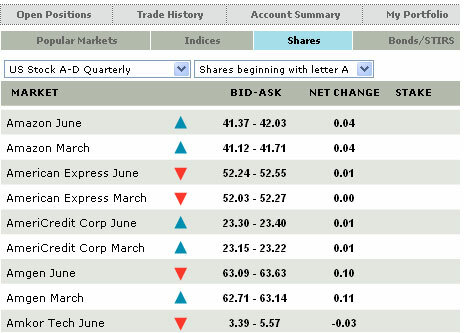 copy the portfolio into Excel or similar, and add columns of useful data (volatility, IMR, current share price perhaps). The idea is that you want the important data readily to hand when trading… you don’t want to jump at a share price move only to discover the bet is rejected because your margin limit has been exceeded. keep the information readily to hand (and a phone, of course) so you can exit trades if your PC or internet connection go down. ensure your PC is secured against virus, intrusion, and spyware. open a simulated account with spreadbet companies (try several) to get as familiar as you can with the platform ? consider having more than one ?live? account when the time comes, some companies are regarded as being better than others for one particular type of bet. review your progress critically, not just trading success but are you buying/selling the right stocks etc? Are your trades only just clearing the spread costs because the share price moves aren’t big enough ? on the other hand are you trading items that are too volatile, risking too big a loss from what is a ?noisy? price chart? You will need to find suitable charting too ? you need a good datafeed whatever period you chart. I shouldn’t have to say this but don’t try intraday trading based on the 15 or 20 minute delayed charts shown on the spreadbet site! I thought this was a useful Article for a beginner however I would have put a serious money management section as from personal experience when you are new it is very easy to get carried away and find you have nothing left to bet with even if you have learnt alot from the experience. The dont risk more than 2.5% rule is good and so is the dont have more than 20% of your capital running as risk at any one time. it's purely intended to highlight some of the things that a newbie might not spot, and might get caught out by.... 'watch out, a gap down can wipe you out' therefore is worth a mention. I would suggest that money management is worth an article on its own, and applies pretty well across the board - not just SB, equally quoting a value like 2.5% for risk is totally meaningless.... only the other day AMZN gapped down something like $7.30, on the average account anyone holding a long overnight would have lost over £700 while the market was shut, with no way to close the bet... some companies offer guaranteed stops, some do not. You can't 'risk 2.5%' unless you can control the exit, and many SB accounts don't allow this, or charge extra for using it. I have no interest in blandly stating 'don't risk X%' when it's not achievable in practise - that just leads to broke newcomers who thought they had the angles covered and have discovered (rudely) that they didn't. Wqually SB is a highly leveraged method of trading, a 2.5% risk implies you will only lose 1/40 of the pot tops... I'll bet the majority of smalltime SB traders have £500-1000 in their accounts, that translates to £12.50 - £25 before you exit - some will have even less (they don't set the minimum accounts down at £100 or so for fun) and you'll be £5-6 down on entering a bet on a $20 share.... no way is anyone with a £500 account, on finding themselves £6 down at entry, going to pay a blind bit of notice to someone blithely stating that they should exit at minus £10.... Personally I'd suggest something like a £15 exit (ie your trade is down £15, out you go) and swap to 2.5% when the account is safely into the 4 digit area. If you exit at £10 down you are effectively exiting when the trade has moved against you £4 - many shares will do that in a heartbeat, you have to have SOME room for a little volatility to play out, or you'll just go broke on 50 consecutive losers that with a slightly wider stop would have been a lower number of trades with a higher win rate. NOBODY calls bottoms and tops right, and having stops too close to the price is every bit as bad for your profits as running them too loose. Thanks Dave, As a smalltime stockholder considering SB (ie not even a newbie) I found your article extremely informative with plenty of explanation for the do's and dont's. What are the advantages/disadvantages of trading in US vs UK stocks / currencies? Can you explain the statement at the bottom of page 1, "there’s no point trading a share that is rangebound in a 10c wide range if the spread is 15c! ", perhaps with a chart? I thought I understood it but I'm not sure of the practicality. In terms of the timebound bets, am I right in thinking that for a quarterly bet you can exit at any time? If so, and you are still two months away from the due date, it seems that you can use a wider stop (obviously with the risk of greater loss) since there are likely to be, with a volatile stock, several chances for regain. More like actually holding the shares. Has anyone looked at this? I presume that with quarterly bets there is no roll over charge each day? ps are there any free real time data feeders out there? sorry for the delay - US markets only just closed and as a working chap I normally only get to trade a few hours a day... got about 30 mins in today, tops! Free data tends to come via Yahoo, except for feeds courtesy of brokers which may be RT and free the average datafeed is 15-20 mins delayed - if EoD trading is okay then Yahoo data can be collected, usually easiest to do that by buying one of the numerous downloaders on the web... if EoD is the aim then say so if you can't find any. RT is more difficult, you can do it on the cheap, and setups like Sierra Chart plus MyTrack can be worth looking at, but I'd be surprised to get a useable datafeed for RT under $30-40... not fully up to speed on cheap RT as I have eSignal myself and don't need to look around for alternatives. US stocks - for me there's one significant advantage, I get home in the 4.30pm - 5pm region most nights, and the UK market is shut... price moves on UK shares aren't overly volatile (you can't trade swings if the price don't move <g>) but they move even slower after the close! Secondly is volatility - prices need to move for you to trade them, US stocks tend to move around, some more than others. If you are trading a US stock intraday and slap something like a swing indicator over the top of it to check, you might find prices have swung up and down 5 or 6 times when you chart the stock on a 10 or 15 minute barchart. I've attached a fairly docile one from today for Checkpoint, note two lines I've added shwoing a fairly steady downmove of $1.43 and a subsequent climb back of 99c... at £1 a point that's £242 in one day if you'd noticed it and got it spot on <g> Very unlikely at my competence level, but the point is that smaller swings need to be bigger than the cost of entering the bet - this relates to the question on 10c move and 15c spread..
... Imagine you enter a bet on a share, due to the spread you are perhaps showing £8 down on entry - you'll be down some amount, as you don't break even until the share has advanced by the amount the SB company choose to take from the deal... on a $25 share you could expect to be down this sort of amount to begin with - the SB companies apply different spreads so exactly how much will vary. Now imagine the share you picked is in a consolidation, tracking up and down a few cents at a time - look at the chart I posted, for the bit prior to the first downward move... a long line of narrow bars with very little price difference from the lowest low to the highest high for maybe 30 bars. (Okay, it's not as flat as many, it's still hardly bouncing like a kangaroo). Assume you entered on the first bar, plumb centre... it might take you 5 hours to see the price move far enough to turn your initial £8 down into a break even. You might wait 5 hours and then see the loss increasing! Quarterly bets expire on the published expiry date, you can exit any time you are happy prior to that - wider stops, yes you can. I would stress however that your stops should be placed logically, I place them based on TA for example, but you might have a fixed percentage stop or anything else in the amazing zoology of stops... they should not be loosened, ever. If the 'story' has changed and you think 'it's bound to go back up soon' then slap yourself <g> IF you are right, and you exited at your stop, then in due course you will observe the bounce you 'knew' was coming, and buy back in for fun and profit. If you widen the stop and you are wrong you go broke quickly, if you widen it and are right you still make less profit than if you exited and bought back in UNLESS you widened the stop exacly on bounce day... and if you catch the falling knife that exactly then the stop didn't need widening anyway. There is no rational excuse for widening a stop under a loser, it is invariably better to exit, sit back, let the slide end, and buy back in at a lower price. The chances of exiting and buying back at a higher price because you 'failed' to widen the stop and it rebounded are so slim they won 'slimmer of the year' 10 years running. Thanks for all the analysis, Dave. Much appreciated - some good fundamental points in there that make me realise how much I've learnt in a short time and how very much more I have left to learn and practise! Being new to analysis (is it that obvious?) I'm intrigued by the fact that there are two large up (green ) candles. The first doesn't lead to much activity but the second precedes the almost uninterrupted 20 interval fall. With hindsight can anyone see why there is this difference? 10 min charts - that's a period I like to watch, you have an OHLC and V for any bar over any time period... a 1 hour bar starting at 11 am for example compiles over 11-1200, the Open price will be the price at 1100, and the close will be the price at 11:59, the High and low will be the highest and lowest prices the share reached between the two times. For the large green candles - I won't swear to it, but I doubt that first one is quite what it seems. Odd single trades go through every so often way off the actual bid:ask then being quoted... for example I'm currently watching Nvidia on my other screen, I saw a trade go through at 25.68 or so a while back although the bid:ask was something in the 25:80 area... these odd 'long way off the bid/ask' trades appear to be legitimate trades, but they don't reflect what the share's really doing - the quote on the SB -platform at the time would have sat immobile at 25:80 or so.... I tend to view long tails up or down with suspicion unless there are solid candle bodies nearby, or the next bar opens in the same sort of area. That first bar MIGHT have traded through that large range in only 10 mins, but I wouldn't bet on it. Most of the screen is missing - gotta watch advertising etc (<cough> esignal) but I wouldn't be overly surprised at the start of that downward move, as there's a gap just prior to it which I'm not surprised to see closed - other than that after a period of low volatility the share flexed up and down before pretty well trucking on sideways. Not a lot of change from open to close therefore, but two nice big moves to trade intraday... hence the attraction. Good overall view as you will get. Hi i am quite new to trading and currently practicing on paper, i would be very greatfull if you could give me some info on which online brokers offer the function to be able to move your stop loss during the trade in order to lock in profits. Will, I've posted a reply to this on the D4F thread. Saying Hello! to members who are willing to share a thought or two with a newcomer to the forum. My background : I have been trading live tru a well reputed SB company for the past 6 mths, with a fair degree of success. The failures have been mainly my wekaness in not exiting a trade at the right time. In some cases it has been my oversight of the market changes at a quick instance. Primarily trading in US Indexes as well as some flutter with FTSE100 which seems to follow DJI most times. Current status is break even. Perhaps one of you members out there would like to send some advice that will make me go positive. It will be very helpful if anyone of you would like to make comment on how to recognise that a change in the combined activity of actual traders is about to happen and that a market is about to change its direction.